You have added Designer Lehenga Choli in Pastel Green & Beige Embroidered Raw Silk to your Shopping Bag! Mark the ethnic glory with this stupendous piece of ultimate style featuring a beige soft net lehenga with a shantoon inner, a pastel green raw silk choli and a Green soft net dupatta. 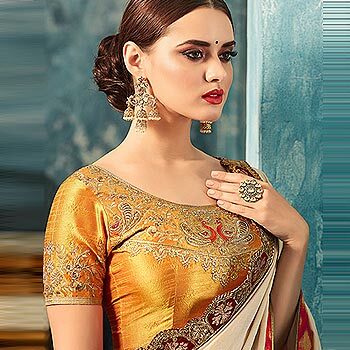 With can can and canvas stitch, this lehenga is a masterpiece to adorn. Peach Thread Embroidered Georgette Multilayered Long.. Designer Lehenga Choli in Magenta & Bluish Green..